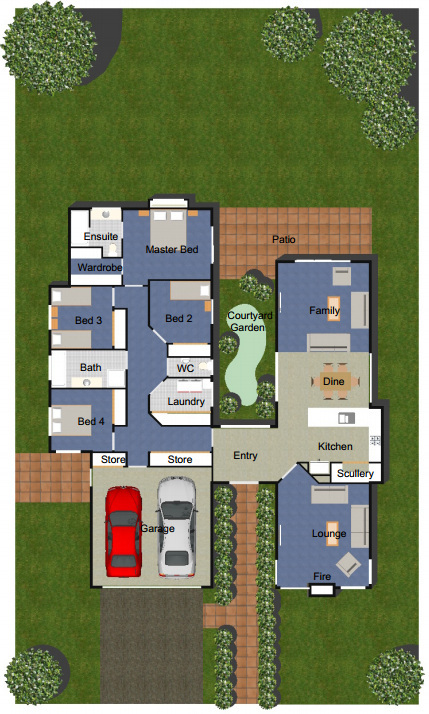 Whatever your vision, large or small, NZ Homes Waikato Limited will make this a reality for you. We apply high standards and principles to every project we undertake to ensure our client’s complete satisfaction. The clean lines of the mono-pitch roof mark this as a thoroughly modern family home. The central courtyard garden is a real "wow" factor. Fill it with a water feature or sculptured artworks for a personal touch and create your own view in the suburbs. 4 bedrooms, 2 bathrooms, large open-plan living and a separate lounge fill up a spacious 230sq.m with a very cost-effective layout. This plan can be rotated or mirrored to suit the orientation of most sections. Sections need to be at least 19m wide and 25m long. The design complies with the new Hamilton District Plan "Interface" rules. Granite kitchen bench, tiled bathrooms & showers, fitted wardrobes, carpet and polished concrete floor with under tile heating, gas fireplace and heat pump, gib goldline rounded corners, separate laundry, double glazing, patios.